The Daily News was New York's first tabloid newspaper. It was launched on July 26, 1919 as a venture of the Chicago Tribune by Joseph Medill Patterson, the cousin of Robert R. McCormick, his co-publisher at the Tribune. After a year, circulation was 100,000, and by 1925 the News was selling more than a million copies a day. Dubbed "New York's Picture Newspaper," the News appealed to a mass audience with its many large photographs and focus on stories of modern urban life, including crimes, scandals, celebrities, sports, cartoons, and reader contests. Advertisements also filled its pages with more large images. 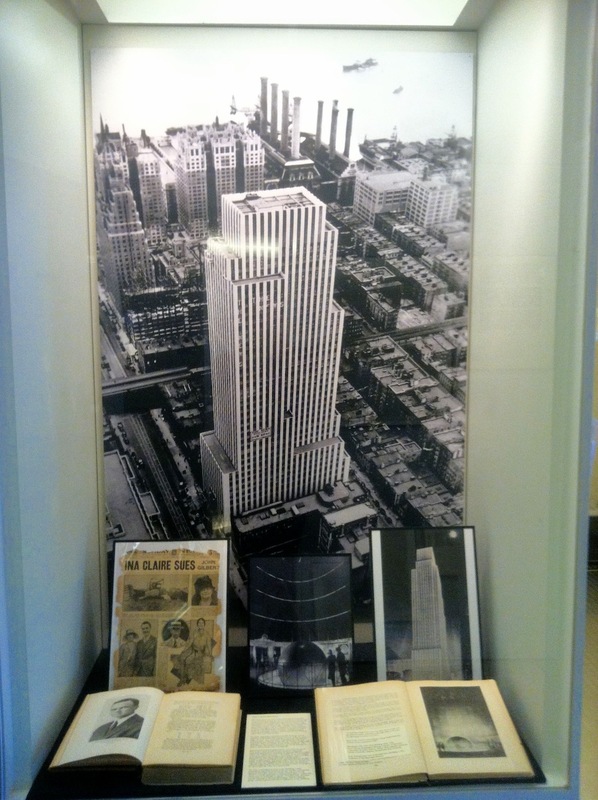 By 1928, expanding circulation and the desire to own its building and printing plant led the News to midtown and a large site on E. 42nd Street mid-block between Second and Third avenues. Patterson chose John Mead Howells and Raymond Hood, winners of the Chicago Tribune contest and designers of the neo-Gothic tower, as his architects. This time, though, the architectural style was not an homage to history, but an expression of modernity. his book The Metropolis of Tomorrow (1929). Raymond Hood had emerged in the mid-1920s as one of New York's most inventive and successful designers, exploring directions of American modernism that have since come to be called "Art Deco." The Daily News was radical in its treatment of the fa�ade as bold stripes--piers of white glazed brick, alternating with dark vertical bands of windows and red and black brick spandrels that ran the full height of the building and ended with a clean horizontal cut. 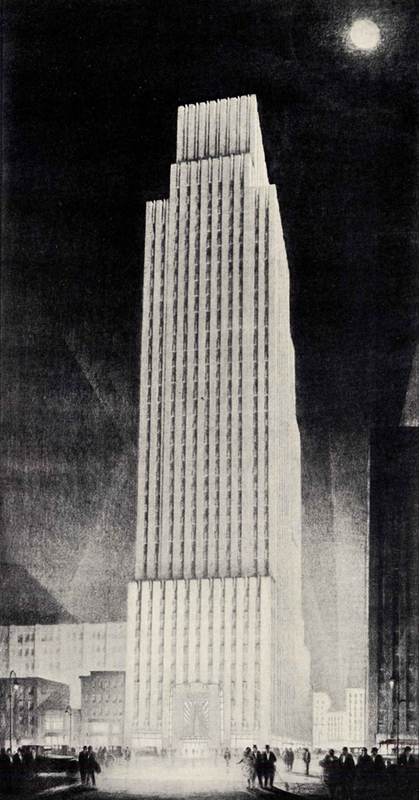 The massing was simplified and without the conventional setbacks suggested by the city's zoning formula: Hood gave his skyscraper the form of a sheer tower. 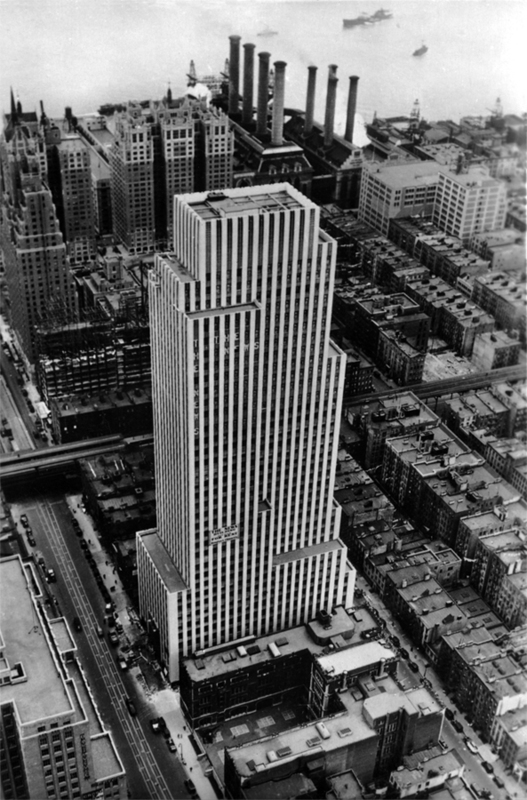 The only extravagant gesture in the building's stark minimalism and economical materials was the monumental entrance and lobby rotunda where, according to Hood, "there is a small explosion of architectural effect... where the owner gave us $150,000 to spend." 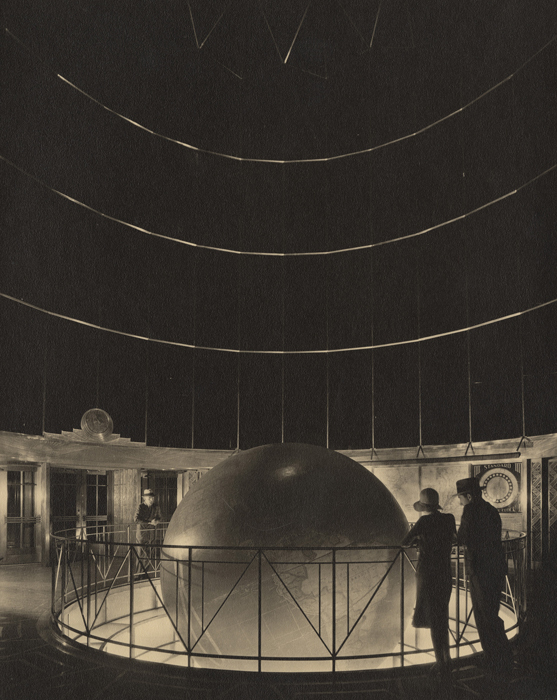 Exceptionally dramatic was the rotunda of faceted black glass with its rotating globe, which attracted crowds of sightseers to the building.